I like to think of it as a guiding principle for that year, a new lens through which to view and approach the world. It's not something specific I want to do more or less of; it's a filter on life. Putting the vibe out, so to speak. But none have stuck the way that "Yes" has. 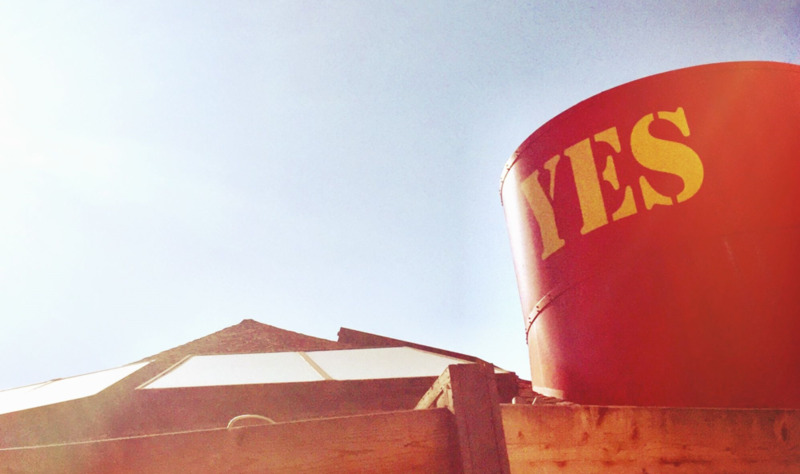 Having the word "yes" in the back of my head has helped me to be more the kind of person people want in their lives. The kind of person who says “yes” when they are invited to dinner or drinks, on a spontaneous road trip, to a wedding. It made 2010 my best year yet, and then made each year since then even better than the last as I held onto the mentality. In June 2012, I got a Facebook message from a stranger named Marc who had lots of friends in common with me. He asked me a random question, and I said, "Yes." The theme that started it all. That year I even got onstage at a wedding and played the cowbell with the band… although technically no one asked me to do that, so I guess it was more of a mental "Yes" moment. All kidding aside, this theme was about being single and in the moment with friends. Not in a scandalous way, because I wasn't dating, but in celebration of being out on the town in your twenties and maybe living a little bit on the edge. That year, I think my friends and I spent an average of five nights a week at Club 185, our favorite neighborhood bar at the time. This was a phrase I typed into the twittersphere during a bachelor party in Vegas where, as often happens at bachelor parties, things became progressively weirder and more random throughout the weekend. It ended up becoming a frequent tagline for me the next year because I liked the idea that situations, relationships, or projects could always be building towards something even bigger. Incidentally, this is the year I met Marc, which escalated from a Facebook conversation into a relationship (and ultimately into a love story and a marriage). Life was moving at a very fast pace, and I wanted to make sure I was maintaining a thoughtful approach. I was also super into the Mumford & Sons "Babel" album at the time, and this is a snippet of a lyric from the song "Not With Haste". In my head, this was the year to take big risks and be more in control of my life, particularly from a career standpoint. But the meaning this theme ultimately took on was more about making life happen. 2014 was the year that Marc and I moved in together, got engaged, decorated a house, and started planning a wedding. It was also one of my most stressful and challenging years at work, the one that tested my resilience the most and required the greatest focus on making it happen. I look back on 2014 and I feel like I accomplished more than I thought I could, both personally and professionally. By the way, when Marc asked me to marry him in June of 2014, I said, "Yes." The year we got married! Which is all I really intended for the theme to be about. But this took on added meaning when, in May, I left my job to focus on my wedding and start fresh on a new career path.